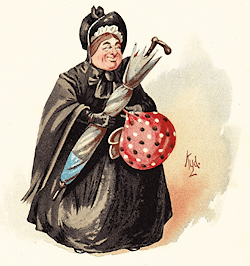 This image of Mrs Gamp, with large bonnet and unruly umbrella, was created by Kyd, real name Joseph Clayton Clarke. Brolly is, all the best authorities assure us, a clipped and altered form of umbrella, supposedly beginning its life as university slang at Oxford and Cambridge in the 1870s (it’s also sometimes known as a brelly, which makes a little more sense). But gamp had preceded it into the printed record for what a writer described in 1864 as “a large, bulgy, loosely tied cotton umbrella”. We are once again indebted to the fertile mind of Charles Dickens. Mrs Sarah (Sairey) Gamp appeared in his novel Martin Chuzzlewit in 1846. She had a large umbrella, “in colour like a faded leaf, except where a circular patch of a lively blue had been dexterously let in at the top”, which entered into so many adventures during the course of the story that it almost become a character in its own right. Gamp is not now much used, even in the country of its birth, but it’s still in the dictionaries and it’s well enough remembered that a crossword setter in Australia could base a clue on it and expect it to be solved. Last modified: 7 July 2012.